Before I begin, I would like to thank the Secretary General and the Chair of the Committee on the Elimination of Discrimination against Women for their reports under this agenda item. The reports provide an excellent overview of the growing attention paid to the important issue of advancement of women. Taking this opportunity, I further wish to thank the Special Rapporteur on Violence Against Women, its Causes and Consequences, for her valuable engagement. Since the fall of the Taliban, Afghanistan has made considerable progress in the promotion and protection of women’s rights. Women’s empowerment has always been a top priority for the Government of Afghanistan. Over the course of last 15 years, Afghan women and girls have been experiencing significant improvements in their political, social, economic, and cultural rights, including the right to education, access to healthcare and the ability to pursue a livelihood and return to work. Today, the voice of Afghan women is much stronger than before as Afghan women continue to play an important role in all walks of life. Our electoral law provides women equal voting rights; we have also allocated 26% of seats in the lower house (Wolisi Jirga) and 17% of seats in the upper house (Meshrano Jirga) for women, which demonstrates a significant representation of women in formal decision-making. Moreover, the number of women who participate at different high levels of the Government and the peace process is growing fast. We are happy to report to this committee that women’s access to education has significantly improved since 2001. Of the 9 million students enrolled in primary and secondary schools in 2015, 40% are girls; this was almost zero before 2001. The number of female students at universities and institutes of higher education has also grown considerably. The progress of SDGs in Afghanistan is directly and intrinsically linked to the overall well-being of the economy, political and security factors. Afghanistan continues to be on a forward-looking trajectory which lends further optimism and ensures that progress on SDGs is imminent. On October 5th, at the Brussels Conference on Afghanistan, the Government of Afghanistan launched Afghanistan’s National Peace and Development Framework (ANPDF) which sets out Afghanistan’s Strategic Policy Priorities towards achieving self-reliance. Women’s economic empowerment as a key aspect for achieving the SDGs is one of the main pillars of our National Priority Program. In this regard, the Government of Afghanistan will invest around $250 million in the next fifteen years. 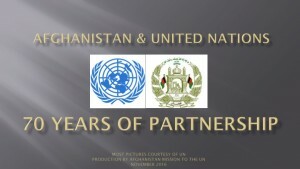 In addition, Afghanistan has also launched its National Action Plan on the implementation of UNSCR 1325 on women, peace and security at the end of 2015. Based on this plan, the number of women in the security forces will be increased by 20%. Nearly four decades of wars and conflicts have resulted in weakened government institutions and have severely damaged the social fabric of our society. Despite major achievements, the situation of women and girls still remains fragile and is a serious concern for the Government of Afghanistan. Cases of violence against women, forced marriages, worsening security situation in some parts of the country, threats of violent extremism and terrorism coupled with poverty are among the main factors that put women and girls in a challenging condition. 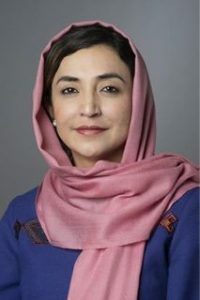 The Government of Afghanistan is strongly committed to continue its fight against all these issues and provide a safe environment for all Afghan women and girls, who make up half of our country’s population, and are heavily invested in creating a peaceful and stable Afghanistan with equal rights for all.